Scroll down this page to view the image. Coloured pencil illustration of a cleanup. 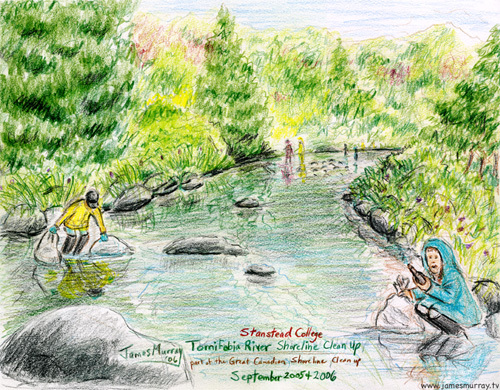 In 2005 & 2006, Stanstead College organized a one day shoreline cleanup of the Tomifobia River, Stanstead, Quebec, Canada. The activity was part of The Great Canadian Shoreline Cleanup. Graphic File Format: JPEG. Dimensions: 500 x 390 pixels. Date: 2006. Browsing Samples: Browse other poster samples by clicking the Previous or Next link. You may also click on a link in the Portfolio Directory below.